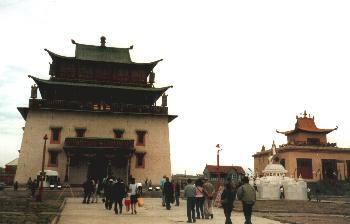 ULAN BATOR, JUNE 2002 - I had absolutely no idea what to expect from the capital of Mongolia. I had read some things about it, seen a couple of pictures, but that was it. And I was very excited to arrive with the train in this city. And it showed to be very surpising and fascinating. Ulan Bator (UB as some call it over there) 'suburbs' begin about 50 km before the city, in the valleys of the hills surrounding UB. 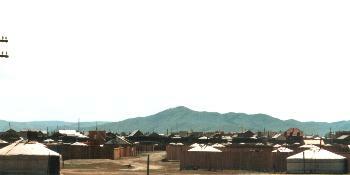 These are settlements, consisting of very basic wooden houses, and gers. The roads are dust tracks, and the dust is blowing over these settlements all of the time. Unbelievable... that was my first thought when seeing these suburbs. Horses , old trucks and old cars are the main means of transport here. Horses can also be seen in the center of town, but this becomes more rare these days. 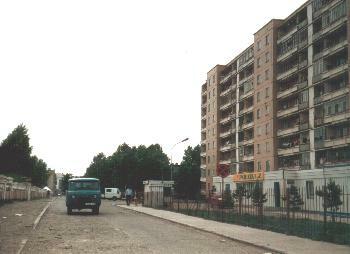 The center of town still is covered in a sovjet atmosphere, and it seems that painting the walls also stopped with the end of sovjet times. A lot of construction going on, but there are more 'half constructed buildings' than finished ones. People are dressed in western clothing, seemingly following the fashion trends from a couple of decades ago, but now and then people dressed in traditional clothing can also be seen. The city has one big shop for tourists (the 'state department store' ), and going to the postoffice and bank is also an experience. UB has some great museums. I visited the Natural history museum, where dinosaur skeletons and eggs, found in the Gobi desert, can be found. The museum needs some modernisation, but it is all very interesting. Our hotel was located in one of the appartment block housing areas of town. Dust roads, decaying appartments and other buidings, like the school and hospital, but also rusty containers, which are used as garages for the likewise rusty vehicles, old factories, many little shops, outdoor grocery markets, but also some internet cafés, and 'telephone offices', where the locals can buy a phone call... Wandering around here gave me an insecure feeling. Many local people just wander around here, people from whom you can see they have very little and to them you are very rich... also street children over here, in winter they live under the street, near the steam pipes commonly used for heating over here. All very thought provoking and to me somehow a saddening experience. On the edge of town , the buddhist Gandan monastery shows that buddhism is reviving here. A busy atmosphere over here, and not only because of the tourists. The Boghd Khan palace on the other hand, is completely deserted. We were the only visitors over there. 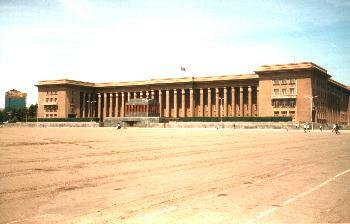 The palace is a museum and very nice artifacts, paintings, statues, etc.. can be seen here - but still it gave me the impression that for Mongolians , this was all to long ago, and that they more care about the present time problems than about the glorious past of their nation.